In-ceiling speakers are slowly becoming popular in residential homes because of their improved sound quality. Some of these speakers do not need a professional installer, you can install them yourself. The speakers sit recessed into the ceiling, providing a minimalistic look to your home. There are several brands of these speakers that differ in price and quality. Good quality speakers produce a clear sound that enhances any living space. Most of the speakers come with a grille that is paintable to match the décor of any home. These types of speakers work normally just like other ordinary speakers. The difference is that they do not take space on the floor and you will not have any visible wires after installation. The wires often run from the sound unit behind the wall and into the back of the speaker that sits in the ceiling or wall space. Our experts are experienced when it comes to product testing in search for the best. Each speaker we picked is durable and will provide you with the performance you deserve. Remember that an excellent in-wall speaker is one that meets your everyday needs.The speakers are purely ranked after considering their sound quality, durability, price and design. 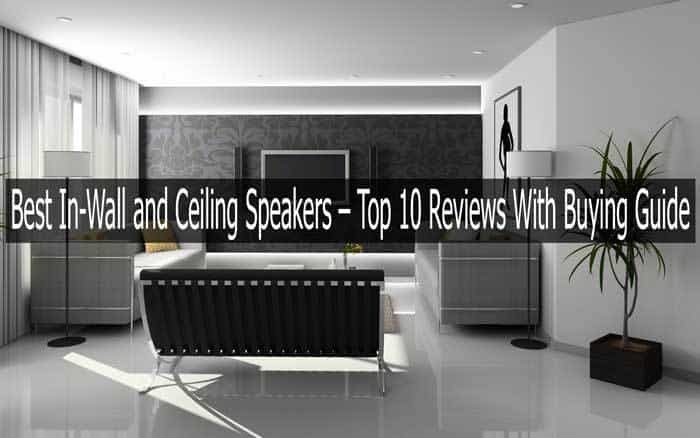 Here are the best in-wall ceiling speakers in 2019 as listed by our experts after several hours of testing and consultations. The RC80i speakers when tucked into the wall or ceiling, will give you a surround sound worth staying home for. The 2-way in- ceiling speakers are great for bringing clear highs and mids into your space. The Polk Audio RC80i speakers can be installed effortlessly into the ceiling or wall without any use of floor or shelf space. To install the speakers, cut a hole and connect the speaker wires and securely place into the ceiling hole. The speaker easily secures itself without any use of accessories. The speakers remain unnoticeable in your home once installed thanks to the printable grille (included). This Polk Audiocomes with a frequency of 35Hz to 20 kHz, to give you crisp highs and excellent mid-range clarity not mentioning a bass out of this world. The speakers produce awesome highs with a great range that adds a layer of sparkle to your music, making the vocals sweet to listen to. The sound is clear and natural at all times. The RC80i is equipped with an 8-inch dynamic balance, mineral filled polymer- composite cone and an inch dynamic balance tweeter with a 15-degree- swivel mount. The swivel mount easily rotates to aim at your preferred listening position, thus ensuring peak clarity. It also allows you to adjust the highs for your room surrounding thus creating a perfect soundstage in your space. The speakers’ sound is perfect for both medium and large rooms. They can also be used in bathrooms and saunas thanks to the moisture-resistant body. The speakers have a simplistic design that will blend easily into your home décor. Generally, the RC80i is a durable ceiling speaker that will give you value for your money years to come. The Polk RC80I is one of the best ceiling speakers with exceptional sound delivery. Yamaha NSIC800WH speakers are one of the best speakers you can find when it comes to sound clarity. The speakers are great if you are looking for a high –end setup in your space, be it the living room or the bedroom. The speakers can work on their own or be part of your sound system. These Yamaha speakers are easily mountable into the ceiling. You will love the fact that they come with mounting clamps that enable you to secure the speakers without a search for additional tools. The magnetic grille which is also paintable make installation very easy, all you need to do is attach it to the speakers. The speaker is made to last, the sealed back cover protects the driver unit from dust and water. The ridge-shaped aluminium cap eliminates high-frequency peaks to give you a smooth sound at peak volumes. The speakers have an RMS out power of 140 watts and an impedance of 8 Ohms. They also have a maximum frequency of 50Hz to 28 kHz. You will also love that they feature a slim design that easily blends into your home décor. The blue polypropylene mica cone woofer and soft dome swivel tweeter highly enhance sound quality and performance of these in-wall speakers. The tweeter swivel will enable you to create a wider soundstage in your space than ever before. The Yamaha NSIC800WH ceiling speakers will pump excellent detailed vocals and sound clarity that will make you want more, thanks to its EQ settings on the receiver. The realistic sound effects will make watching movies great than what you are used to. The speakers provide great volume and dispersion across the room effortlessly. The midrange sound is consistent and properly defined. There is always a nice punch to music thanks to the speakers' great sonic impact. The bass effect is smooth and natural. The Yamaha NSCI 800 speakers are designed to produce high-quality sound without distortion. The frequency response is also good. There is no doubt that these speakers have all the features of a high-performing ceiling speaker. They are totally worth the investment. Find the best prices for these amazing speakers on Amazon while stock lasts. The Micca M -8C speakers are designed to provide both relaxed background music and high impact performance. This pair is what you need if you are on quest to find speakers on tight budget. The speakers are easy to install with a screwdriver. The mounting tabs are made in a way that they automatically hook onto the surrounding wall securely. This is a 2-way in-wall speaker featuring 8'' poly woofer for increased low-end responses and a 1'' soft dome tweeter for extended highs. The tweeter is connected through a 6db to achieve better sound coordination and performance at its 40Hz- 20kHz frequency response. The speaker produces decent natural sound with a smooth bass output. This means that you get to listen to more than you bargained for. This is a speaker for you if you do not plan to get a dedicated subwoofer for enhancing the low frequencies. These mica speakers can also be connected to your home theatre receiver to create a full sound for the extraordinary listening experience. Playing music on these speakers feels as if you are seated right inside a concert hall. The speakers are both clear and loud, giving you a great sense of where the music is coming from. The sound from the speakers delivers crisp highs and great punchy low ends. The speaker has a V-shaped sound signature that concentrates on the highs and low frequencies. The overall sound from the speakers is great to listen to. Push-fit grille may occasionally loosen as they are not screwed on. The mica M-8C is one best speakers to buy if you happen to be on a budget. The performance is impressive at its affordable price. There is no doubt that Amazon has the best price for Micca M-8C that is worth checking out. The Acoustic Audio CS IC83 is an example of excellent quality speakers found in a compact set up. Just like some previous models on our list, this speaker is also a 2-way design. The speaker can be easily installed with simple hand tools. The installation itself is simple thanks to the full instructions manual included in the box. The speakers mount perfectly on the walls and works well with other home theater applications. The spring-loaded speaker wire allows for easy connectivity. The speakers come in a metal grille which can be painted to suit your ceiling colours. The Butyl rubber surround increases the speaker's performance and durability. The rubber also withstands high temperatures and moisture that can easily damage the stereo. It is a 3-way stereo sound speaker with a 1’’ poly dome tweeter for quality sound delivery. It has a good frequency of 40Hz 20 kHz and has a 350 watts rated peak power. With an impedance of 8 Ohms and a sensitivity of 95dB, the highs and midranges will feel clean and detailed. The 13mm soft dome tweeters allow you to adjust sound projection to any particular area in your space. The integrated wall-lock mounting system ensures that your speaker remains safe and in place. The R-5502-W left centre or right speakers deliver compelling sound as needed. The speakers concentrate highly on the bass and high notes to produce quality sound, thus a great option for anyone looking into sound quality and balance. The Klipsch R- 5502-W features a 1'' titanium tweeter that is ideal for homeowners working on a bigger budget to upgrade their home music system. The speakers employ a dual 5.25-inch cerametallic woofer cones for fast and natural sounds. The speaker’s horn-loaded technology on titanium tweeter produces flat frequency responses with high efficacy but low distortion. The speaker has a sensitivity of 92dB and a frequency response of 46Hz 20 kHz with an excellent power output of 75RMS 300 watts peak handling. The speaker continuously and consistently delivers clear smooth sound when installed vertically or horizontally. The all-new sure grip provides adequate pressure against dry walls for long-term installation. The speaker’s paintable grille easily blends in with any home décor. The custom EQ settings allow the speaker to be adjusted to its environment. The IR receiver knockouts holes allow for infrared repeaters hence bringing configurations to the installer. This pair of speakers easily integrates with other audio systems to give you a new listening experience like never before. Installation is simple, does not need an expert. Speaker may not function properly when installed horizontally. The R-5502-W offers wide flexibility. Its timbre is perfect; it will work well in a home theatre setting or in a surround sound set up. Fit the R-5502-W speakers into your ceiling for a fresh music experience. The JBL SP6II 2-way ceiling speakers are one of the best speakers that deliver crisp sweet highs. This company has been around for many years producing quality electronics. With a frequency of 38Hz- 20 kHz, this SP6II speaker produces a full sound range from deep bass to very high frequencies. The speaker is easy to install. It also comes with faceplates and grilles which can be painted to match your room décor. The speaker comes with a paper tab tucked under the speaker grill to allow you to remove the grill easily. You only need to be careful; it may tear off if you use too much force. It has a space saving design, which offers you maximum flexibility of being able to install it anywhere. It can also be integrated with other speakers during the set-up. The speaker has a classic design of a titanium laminate tweeter for increased high-frequency sound reproduction. The speaker comes equipped with rubber surrounds which reduce damage and provide enhanced durability. This JBL SP6II comes with dog-ear bracket that allows for the retrofit application. The speaker has a swivel mount tweeter that you can easily adjust for a greater sound projection in your space. The JBL SP6II produces an excellent sound with detailed highs when connected to a powerful home theatre receiver. The speakers are also incredible when it comes to watching movies; they will bring new powerful sound effects to your sitting room. The speakers work well with a 5.1 or 7.1 system as front or rear speakers. Low profile design that makes it barely noticeable. JBL SP6II delivers clean and smooth sound. Its performance is highly recommended. There is no doubt that these speakers will bring a lot of new experience to your living space. Check out the JBL SP6II ceiling speaker on Amazon and buy it at a cheaper price than elsewhere. The Pyle two way speakers might be the right one for you if you are looking for great speakers that will not cost much. Talk of classy design and powerful bass, Pyle knows what a high-quality speaker is supposed to be. The speakers weigh only 9.8 pounds so that you are able to install into the ceiling without much effort. It has an in-built mounting hardware for easy installation. The set-up manual is easy to read and understand. The speaker is easily connected through wiring; the wires can be installed cleanly to prevent messiness. The speaker's system can be adjusted easily and angled to the direction of the listener's speaker is fit for an average room, but again because it will be installed in the ceiling; it won't take much of your space. The speaker is white in colour which easily blends into your wall or ceiling décor. The rubber surrounding for increased durability and a pivoting 1'' soft dome tweeter that is used to adjust sound projection to the preferred area. With the adjustable treble; you can easily add your volume without hearing any distortion whatsoever. The speakers have a sensitivity of 88 dB and an impedance of 4 to 8 ohms, with an excellent power output of 150 watts RMS and 300 watts peak. The frequency of 35Hz to 20 kHz enables these speakers to deliver an excellent full-range sound. The sound is pretty balanced and delivers crisp highs with amazingly midrange frequencies. The highs are clear without any harshness. While the midbass has a great sound that you can listen to all day long. The Pyle PIC8E works well with 7.1 and 5.1 speakers to produce quality sound. Instrumental music and vocal performances will sound great. Even though the speaker is light on highs, it has plenty of midranges which is more than enough to make up for it. The Pyle PIC8Es are decent speakers with a high performance. They are the best speakers in the mid-tier range that is if you are looking for quality at a good price. Buy the Pyle PIC8Es from Amazon and change your listening experience for good. The 82C Silver Ticket speaker is one of the most versatile speakers in the market today. It integrates well with a 5.1, 6.1 and 7.1 home theatre systems. The speaker is an excellent example of what a high- quality speaker looks and sounds like. The speaker has a slim design around the edge for easy installation. Additionally, it comes with a flip-lever quick mount system which makes the installation process easy and secure. For high-quality long-lasting sound, the speaker is made of mica polypropylene. This makes music and movie vocals simply out of this world. The high-grade rubber edge also allows for audio accuracy providing sound quality that lasts long. The speaker features a 20 mm silk dome tweeter pivot that enables you to tune the sound to your likeness. The extra heavyweight magnet allows for tuning with the voice coil providing a brilliant clarity at all volumes. It does not sound harsh even at high volumes. The speaker has a sensitivity of 89+/-2 dB and an impedance of 8 Ohms, with an excellent power output of 60 watts RMS and 120 watts peak. The frequency of 47Hz to 20 kHz enables these speakers to deliver an excellent full-range sound. The sound is pretty balanced and delivers crisp with highs. You can use this speaker in the bathrooms and saunas thanks to its water-resistant solid construction. With these speakers, you are not only looking at a great product, you will also get good sound quality and utmost entertainment. Buy the 82C Silver Ticket in -wall ceiling speaker for a fresh music experience. The theatre solutions TS80C produce high-quality sound. These are the speakers to get if you want to change your living area into a little live cinema hall. The speakers come with 8'' black woven fibre bullet cone and an 8 Ohms driver rated at 250 watts RMS and 500 watts peak. The installation process is easy; the speakers come with cut out templates and detailed installation instructions for easy referencing. The speakers can be a great part of the surround speaker set-up to produce distinctly clear sound and great midrange performances. The highs are clear and decent when connected to a good performing home theatre. The overall sound is natural and smooth. There is no doubt that these speakers are able to deliver full range sound. They have a high frequency of 30Hz to 20 kHz with a sound sensitivity of a 92dB. The speakers will rock your entire living space; you will love the TS80C speakers if you are into a full home theatre experience. Each speaker comes with a silk titanium dome tweeter and a 15-degree swivel mount. These features enable you to easily adjust the sound projection to the area of preference. Listening to music in your space feels like sitting in a cinema. You will appreciate the deep sound effects and punchy beats that penetrate the entire room. You can crank up the volume and still expect clear and quality sound. These speakers are moisture -resistant, making them ideal for use in the bathroom and outdoors as long as they are protected from the heavy rains. The theatre solutions TS80C are great in-wall surround sound speakers that deliver quality sound and excellent performance. Consider these in-wall speakers and make your home music lively. The ICE800WRS 8 inch is excellent for high humidity areas. The speakers are in a set of 4, producing unmatched sound even after years of use. The OSD audio have a solid construction with a water-resistant coating that makes them suitable for outdoor use. The speakers deliver superior sound thanks to their high power handling and an 8 –inch polypropylene woofer in each. The speaker's santoprene surround withstands high temperatures and moisture. Even though, we are not recommending that you place these speakers in direct contact with water, this may damage the speaker's inner compartments. This OSD audio has an elegant low design that makes it less prominent in living spaces with low ceilings. The speaker comes is a grill that is removable since you have access the screws of the toggle bracket so that you can mount the unit to your hole cut-out. The grill is paintable with either a spray paint or a brush if you wish to match your décor. The ICE800WRS 8-inch speaker has 1’’ polycarbonate dome tweeter for extended highs with a sensitivity of 90dB It can also have a wide frequency of 38Hz- 20 kHz to deliver exceptional sound. The sound quality of the OSD speakers will surpass your expectations. The 1’’ polycarbonate dome tweeter produces a smooth sound that is nice to listen to. The tweeter also enhances the crispness of the vocals in each music you listen to. The speakers hold up pretty nicely without any distortion, even on high volumes. The bass hits hard, with good low-end responses that will get you listening all day long. The EQ settings on the stereo receiver can be adjusted accordingly to suit your room environment. The speakers’ works perfectly well with a CL-3 in-wall rated speaker wire. This type of wire is designed to run inside the walls. It is affordable and includes a special shielding for in-wall mounting. The speakers come with a 10-year warranty to back up their quality. These are great speakers if you are looking for ceiling speakers with a weatherproof resistant design. They are one of the best speakers you can find for a damp home or surrounding. There is no doubt that Amazon has the deal for the OSD Audio ICE800WRS 8'' that is worth checking out. There is no doubt that in-wall speakers create an awesome quality sound that any homeowner would admire. The sound quality depends on the length and thickness of wire running to it. The thicker shorter wires produce quality sound than their longer thinner counterpart wires. It is important to make sure that the speakers you intend to purchase have wires that are designed for ceiling use. This is in bid to adhere to the fire and building regulations. You need to buy a speaker that will fit into your living space perfectly. The correct size of the speaker will give you a more efficient sound. Speakers that are small may not provide good quality sound, in most cases, the sound will come off as harsh. Speakers that are designed for indoors often get damaged when used outdoors. In the same manner, it is not advisable to install the speakers in an area that tends to heat up, unless the speakers are constructed to handle such harsh conditions. You need a woofer if you will be using your speakers for serious music listening. A powerful woofer fills out the low frequencies giving you more decent and natural sound. All ceiling speakers are sold with a white grille. However, the grille can be painted to suit the home décor. These types of speakers are either round or square. Round is the most preferred and recommended shape. However, you may be forced to install a square-shaped speaker if you have installed square down lights in your living space. Both the round and square speakers produce the same quality of sound. The shape of the speaker you buy will depend on your personal preference. It is important to set a price range based on all the factors above. Even as you look for speakers, remember that you may need to remain within your budget. There are several speakers with good design and quality sound at an affordable price. All you need to do is take your time, find one that perfectly suits you.